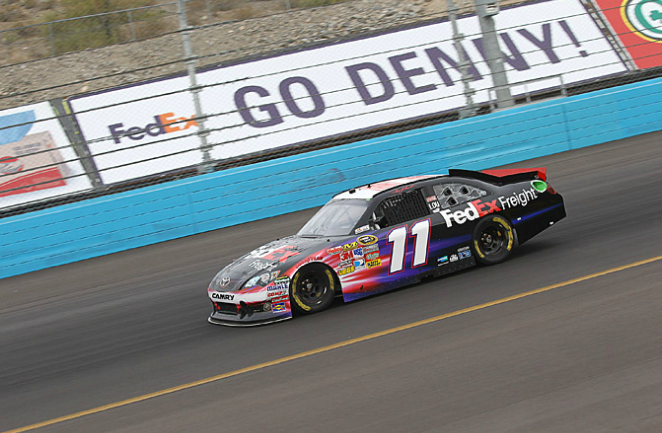 Denny Hamlin drove the #11 FedEx Freight Toyota Camry to a 12th-place finish in Sunday’s Kobalt Tools 500 at Phoenix International Raceway, the penultimate race of the 2011 NASCAR Sprint Cup Series season and Round 9 of the Chase for the championship. 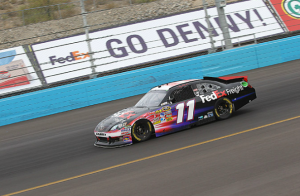 Hamlin attacked the newly-paved and reconfigured one-mile desert oval from the drop of the green flag, working through traffic from his 33rd starting position to climb near the top-20 by the race’s midpoint. A timely caution just past the halfway mark — in the middle of green flag pit stops — allowed the FedEx team to make a stop during the yellow and move to the brink of the top-10. The 30-year-old Virginian, who sat on the pole in his very-first Phoenix start in 2005, battled a nagging tight condition in the center of the corners which prevented him from challenging for the victory in the 312-lap event won by Kasey Kahne. Crew chief Mike Ford called for a variety of wedge and air pressure adjustments throughout the race in hopes of freeing up the #11 machine, but the track’s changing conditions throughout the afternoon made it a difficult task. The finish kept Hamlin 10th in the Chase standings following Phoenix, as only three points separate leader Carl Edwards and second-place Tony Stewart heading into next Sunday’s finale at Homestead-Miami Speedway.